The questions surrounding Arsenal’s center forward have always been a topic of debate; sometimes more heated than it’s needed to be. After being spoiled throughout the years by the likes of Ian Wright, Dennis Bergkamp, Thierry Henry, and Robin van Persie, we’ve been graced by the acquired-taste that is Olivier Giroud. Opinions on the big Frenchman are akin to his performances on the pitch for the club, divided. On his day, for both club and country, Giroud is capable of brilliance; his goal at the weekend against Crystal Palace showcasing just what he is in fact capable of. But there are other times, where wayward finishing, lethargic running in the box, and remonstrating with the referee more so than putting his nose to the grind have plagued the perceptions surrounding the former Montpellier front man. Though his goal scoring record for the club is laudable indeed, Giroud has given way to the Chilean energizer bunny that is Alexis Sánchez. Not traditionally a “center forward”, having only been deployed in such a manner earlier on in his career at Udinese along-side Antonio Di Natale, and more recently for the Chilean national team in a front two with Hoffenheim forward Eduardo Vargas – and never the lone man up front. What Sánchez has proven throughout his career, and has gone on and continued to do currently for Arsène Wenger’s side, is that he is incredibly versatile; and it has paid dividends for us this season. Perhaps one of the most recognizable (and equally frustrating) attributes that Wenger has acquired over his glistening managerial career is his willingness to mold players to new roles. Now, granted, there have been quite a few examples of players he has tried (and failed in stunning fashion) to mold into something they weren’t, but the examples of Thierry Henry, Robin van Persie, Santi Cazorla, Francis Coquelin, and now Alexis Sánchez, stand out as success stories. In the case of Sánchez, a player who really made his name during his time at the Camp Nou as a wide player, he was seen by Wenger as a player who drew comparisons to Henry – quick, agile, technically wonderful, tactically flexible, and able to both run at his marker and hold the ball up as well – all qualities so many of us have wanted in a center forward for a while now. The credit can only go to Le Prof so much, however, as it’s been Sánchez’ tireless work ethic and dedication to improving constantly as a player both at London Colney and on the pitch, that has seen him become an even bigger success story for the club than he already was. 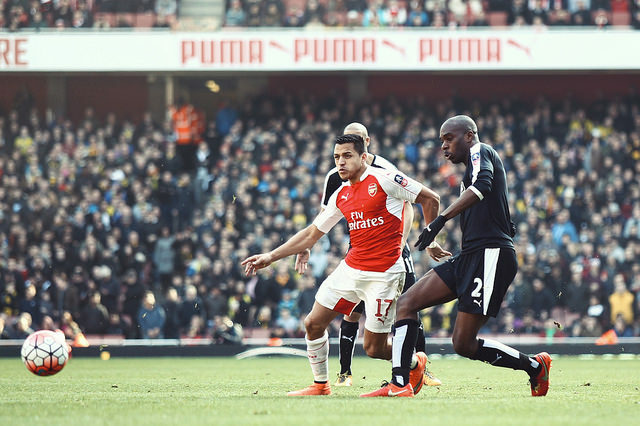 Alexis’ flexibility has been key to his success up front this season. Credit joshjdss under license. At current, Alexis is on course to best his performance in 2014-15 when he bagged sixteen goals in the League and added a further seven assists, and at the time of writing coming into the showdown at the Vitality Stadium against Bournemouth with twelve goals and eight assists in just nineteen outings in the League thus far this season (he added one to that goal tally – ed). Despite being tasked in a new role, the first time in his career where he’s been routinely deployed as the lone front man, not only has Sánchez excelled, but his production has markedly improved. Not only is he on pace to beat his personal best for the club, but also to put forth the best single season numbers of his entire footballing career to date. As mentioned before, it’s been Alexis’ versatility as a player that has allowed him to succeed; more importantly, it’s allowed others around him to improve as well. Theo Walcott has shown signs of becoming a more reliable goal scorer when deployed on the right side of the attacking four (his eight goals thus far are second-best for the club), Alex Iwobi, though still young and inconsistent at times, has also shown signs of improvement in his overall game and match understanding, and Olivier Giroud has shone in his new role as super sub, providing Arsène with a reliable plan B off the bench. If you were to take a quick glance at some key statistical markers in Sánchez’ game, those numbers lend further weight to just how his versatility has helped the club in more ways than one. Averaging 2.45 key passes and 2.84 chances created per ninety-minutes, Sánchez’ current assist count of seven (good for third in the Prem), has helped productivity remain a constant in the absence of Santi Cazorla and a downtick in numbers from Mesut Özil. Likewise, his 2.73 successful take-ons in the same time frame show that he is still capable of taking a match by the scruff of the neck and make things happen when our supply lines in the opposition final third are being strangled off. And in paying due diligence to his work rate, he averages over one tackle per match and even chips in when defending from the front with ten interceptions this season. Numbers of course, as they say, don’t prove everything, but the tangible evidence provided on the pitch, backed by those numbers, has allowed players around Sánchez to find joy. It’s allowed more space for both Walcott and Alex Oxlade-Chamberlain because Sánchez pops up all over the pitch in a multi-faceted role. It’s allowed Alex Iwobi to see more of the ball and become an increasingly efficient link in the build-up. It’s given added defensive support in central areas further up the pitch, and it’s taken pressure off Giroud’s shoulders and allowed him to re-discover a bit of form and confidence. Most importantly, it’s now given us a bit of tactical flexibility, something we have been lacking in recent seasons, a key component required for any side who has title winning ambitions. Free flowing movement when going forward, additional support when defending, better tactical options off the bench in the forms of Giroud (when he’s not starting), Ox, and even Aaron Ramsey have seen us improve out balance substantially. Flexibility has always been key, and it’s a quality we have lacked for years. After a disappointing 3-3 draw at Bournemouth (which did feature a spirited fight back in the end), we now sit eight points adrift of a Chelsea side who, with a match in hand, have a chance to break our record of thirteen wins on the trot. The reality is that this season, which started with such promise, may end in more disappointment for us. We may not go on and win the league, but looking ahead to next season, and taking a silver lining from our current squad, Alexis Sánchez’ talismanic presence and the flexibility he has given us can hopefully allow us to challenge once again. Drew is one of our #ABW Regular Columnists and can be found on Twitter as @AFCBvB1410. When not writing for us, he also writes for Outside of the Boot and FutbollPulse, and he’s a regular hipster on the Football Hipsters Podcast. This entry was posted in NewsNow, The Bergy Blog and tagged AFC, Alex Oxlade-Chamberlain, Alexis Sanchez, Arsenal, Arsene Wenger, Gunners, Olivier Giroud, Premier League, Tactics, Walcott, Wenger. Bookmark the permalink.